It’s 8 am, and I am sitting here, like a zombie, my body still struggling to get used to daylight savings time! Last week, I would’ve had an hour’s worth of activity behind me by now… Why oh why, can’t we leave time alone–or at least leave it one way or the other? My daughter and her family are still struggling with sickness. At least one person in their household has been sick ever since January! Yesterday brought more doctor appointments and more trips to the pharmacy for my daughter and granddaughter. At one point, all three people in the family were taking antibiotics! I hope and pray they will soon be well! Sickness struck my oldest son’s household, too, but everyone there seems to be recovering quickly. Last week, I discovered what a good “work out” gardening and yard work can be! I raked and burned pine straw and leaves for TWO DAYS! Ed joined me on Friday, and the process went along much faster. We’re not quite finished, but things are looking much better. Strong winds prohibited any burning on Saturday. Ed and I also planted two rows of vegetables in our garden over the weekend. So far, we have planted carrots, radishes, garden peas, and green beans. This year, we’re learning as we go–or should I say learning as we grow?! Two weeks ago, Ed and Clint, our son-in-law, planted irish potatoes, some of which are now trying to break through the ground. I plan to write a gardening post soon. I’ve adjusted pretty well to my new dosages of thyroid medication, and HRT, and I am feeling much better overall. I feel better and have more energy than I’ve had in a long, long time! It was well worth the struggle to get to this point, and I sure hope it lasts! Before, I could barely hold out to vacuum the floor, now I”m raking the yards! It’s funny, whenever I blog, I write about whatever is on my mind, not always thinking about who might read it. Yesterday I posted about our Agri Supply store, and my experience there. This morning I woke up to find a comment from an employee of Agri Supply’s corporate office! She thanked me for my kind words about their store. Who knew, that any Agri Supply corporate office personnel would find and read my blog?! One of the most wonderful things about blogging is getting to meet nice people from all over the place! I’ve met so many nice people, and learned so many new things during my years of blogging. Both are “perks” that I never expected when I began this blog..
At the time, Doreen was still healing from the tragic death of her younger brother, David. She was also in the process of writing a book entitled Bristol Boyz Stomp. Her book is about the senseless, brutal attack on her brother, which ultimately led to his death. It’s also about the events that followed as the family sought justice for David. Doreen shared parts of the book on her blog, and I always knew it was going to be an interesting read. Through Doreen’s blog, I was able to follow along as she shared the progression of her book. Along the way, Doreen held some contests, and I entered one of the contests. A few weeks ago, I was notified that I had been selected as one of Doreen’s contest winners, but I had no idea what my prize would be. Imagine my surprise when a copy of Doreen’s book arrived in the mail a couple of Saturdays ago! I squealed with delight! I’ve wanted to post about this book, and how proud I am of Doreen and her accomplishments. 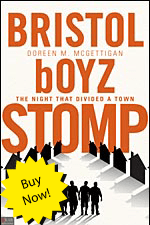 When I discovered that Bristol Boyz Stomp was being released on Tuesday, November 8, now seemed like the perfect time! Check out Doreen’s book below. If you click the picture of Doreen’s book, it will give you a brief synopsis of the book, plus details of how to order, in case you’re interested. ***Congratulations on the release of your book, Doreen! It’s a winner!